Now is Wow: The mystery of Love ... solved at last! 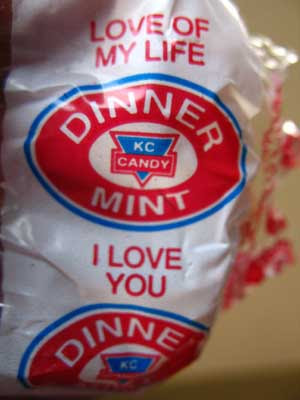 Those of you who were reading my blog in May last year will remember my quest to find out the meaning behind the endearing messages on the KC dinner mint wrappers. Anyway, the S.K. who sent me the e-mail was not the same S.K. from the above blog excerpt. She is the grand daughter of the late founder of KC! As I began to read her unexpected e-mail, my first thought was: "Wow ..."
I of course said "Yes!" ... The messages, Love, people's feelings about the mints and about their experiences with giving the wrappers to their beloveds, their local and global appeal over time. This will be for KC's 85th Anniversary supplement. Imagine that ... KC has been around longer than most of us reading this have been alive. Of course, the main question I asked S.K., who has been very keen and kind ('Keen and Kind' sounds like a KC message in itself) was: "Who is responsible for these messages?" It's the question many may never have wondered about ... but no doubt would love to know! Stay tuned for her answer tomorrow. 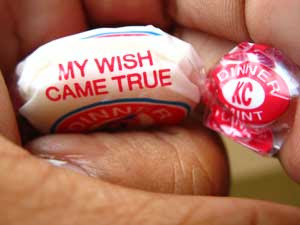 And feel free to leave a comment here if you have had any special experiences with KC dinner mints in your lifetime. If there is space I may include it in the article. I already have some comments from last year which I will include (... taking liberties, but I don't think those readers would mind me including their comments).